Samuel Luther "Big Sam" Thompson (March 5, 1860 – November 7, 1922) was an American professional baseball player from 1884 to 1898 and with a brief comeback in 1906. At 6 feet, 2 inches, the Indiana native was one of the larger players of his day and was known for his prominent handlebar mustache. He played as a right fielder in Major League Baseball for the Detroit Wolverines (1885–88), Philadelphia Phillies (1889-1898) and Detroit Tigers (1906). He was inducted into the Baseball Hall of Fame in 1974. Thompson had a .331 career batting average and was one of the most prolific run producers in baseball history. His career Run batted in (RBI) to games played ratio of .923 (1,305 RBIs in 1,410 games) remains the highest in major league history. In 1895, Thompson averaged 1.44 RBIs per game, and his 166 RBIs in 1887 (in only 127 games) remained the major league record until 1921 when Babe Ruth collected 168 (albeit in 152 games). Thompson still holds the major league record for most RBIs in a single month with 61 in August 1894 while playing for the Phillies. Manager Bill Watkins in 1922 called Thompson "the greatest natural hitter of all time." Defensively, Thompson was known to have one of the strongest arms of any outfielder in the early decades of the game. He still ranks among the all-time major league leaders with 61 double plays from the outfield (16th all time) and 283 outfield assists (12th all time). Thompson also had good speed on the base paths and, in 1889, he became the first major league player to reach 20 home runs and 20 stolen bases in the same season. Thompson was born in Danville, Indiana, in 1860. He was the fifth of eleven children born to Jesse and Rebecca Thompson. He was educated at the Danville Graded School. After reaching adulthood, Thompson became employed as a carpenter in Danville. He and five of his brothers also played on a local baseball team known as the Danville Browns. In July 1884, Thompson began his professional baseball career at age 24, playing for the Evansville, Indiana, team in the Northwestern League. A scout for Evansville travelled to Danville and was referred to "Big Sam", who was working on a roof in Stinesville. Thompson was initially reluctant to give up his carpentry career and travel 150 miles to Evansville, but he ultimately agreed to give it a try. Unfortunately, the league folded in early August 1884, after only five games. In five games at Evansville, Thompson compiled a .391 batting average. Thompson signed with the Indianapolis Hoosiers of the newly formed Western League in 1885. He compiled a .321 average in 30 games with the Hoosiers. He was approached by a Union Association team and offered more money, but in a show of "steadfastness to his word," Thompson refused the offer and remained with Indianapolis at a pay of $100 per month. The Hoosiers were the dominant team in the Western League, compiling an .880 winning percentage. In mid June 1885, the Western League disbanded, and a mad rush developed to sign the players on the Indianapolis roster, a line-up that included Thompson, Deacon McGuire, Sam Crane, Chub Collins, Jim Donnelly, Mox McQuery, Gene Moriarty, and Dan Casey. "We were prisoners, but well cared-for prisoners. Anything in the line of creature comforts you could find packed away on ice. We lived on the best in the market, and spent the rest of the time in fishing and playing poker, chips having very thoughtfully been provided. On the night of the tenth day, at midnight, we were all taken ashore where Watkins met us and signed us to our contracts." The players were only later presented with their accumulated mail which included scores of offers from other clubs. A writer in the Detroit Free Press later noted: "Detroit magnates showed some inside baseball brains and great finessing in sending the players away from all tempters for that period when they belonged to no club." Regardless of the trickery by Detroit, Thompson considered Detroit to be a mecca. He recalled his first time in 1885 viewing Woodward Avenue with Indianapolis teammate Mox McQuery. They gazed with "open-mouth amazement" at the "wondrous pavements", having never seen a street as "clean and smooth as a table." Thompson joined the Wolverines lineup in early July. In his first plate appearance, he had a hit off New York Giants' Hall of Fame pitcher Tim Keefe. The Wolverines were in last place when Thompson joined the club, but won 12 of their first 13 games after Thompson took over in right field. Thompson compiled a .303 batting average in 63 games. Despite playing only the second half of his rookie season, Thompson ranked among the National League leaders with seven home runs (third most in the league) and nine triples (10th most in the league). Displaying a strong arm that would be one of the main features of his defensive game, Thompson also ranked fifth in the league with 24 outfield assists in only 63 games. In 1886, team owner Frederick K. Stearns made a big splash when he purchased the Buffalo infield that had become known as the "Big Four", consisting of Dan Brouthers, Hardy Richardson, Jack Rowe, and Deacon White. In addition, Detroit pitcher Lady Baldwin won 42 games in 1886, a major league record for a left-handed pitcher. The 1886 season was Thompson's first full season in the majors. Thompson made a major contribution to the 1886 club as well, compiling a .310 batting average with 101 runs scored, 13 triples, and eight home runs in 122 games. His 89 runs batted in (RBIs) ranked third in the National League. His defensive statistics continued to impress as well. He led the league with 11 double plays from the outfield, ranked second with a .945 fielding percentage, and was fourth in the league with 194 outfield putouts. The 1886 Wolverines compiled an impressive 87–36 record (.707 winning percentage), but lost the National League pennant, finishing 2½ games behind the Chicago White Stockings. Thompson had his breakout season in 1887 when he won the National League batting crown with .372 batting average, and he set a major league record with 166 RBIs. Thompson also led the league in hits (203), triples (23), slugging percentage (.565), total bases (308), and at bats (545). On May 7, 1887, Thompson became the first player in major league history to hit two triples with the bases loaded in the same game. 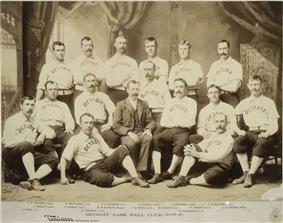 The 1887 Detroit Wolverines featured four future Hall of Fame inductees (Thompson, Dan Brouthers, Deacon White, and Ned Hanlon) and won the National League pennant with a 79-45 record. The Wolverines then went on to defeat the St. Louis Browns of the American Association in a 15-game World Series challenge. Thompson played in all 15 games of the World Series and led all hitters with a .362 average, two home runs, seven RBIs and a .621 slugging percentage. During the 1888 season, Thompson was sidelined with a sore arm during most of the season and appeared in only 56 games. His batting average declined by 90 points to .282, and the fortunes of the entire 1888 Detroit team followed suit. The team finished in fifth place with a 68-63 record. With high salaries owed to the team's star players, and gate receipts declining markedly, the team folded in October 1888 season with the players being sold to other teams. On October 16, 1888, Thompson was purchased from the Wolverines by the Philadelphia Quakers (known as the Philadelphia Phillies beginning in 1890), for $5,000 cash (equal to $131,241 today). In his first season with Philadelphia, Thompson hit .296 and led the National League with a career-high 20 home runs. He also became the first major league player to reach 20 home runs and 20 stolen bases (Thompson stole 24 bases) in the same season. Thompson improved his batting average to .313 in 1890 and led the league in both hits (172) and doubles (41). Thompson's batting average dipped slightly below .300 in 1891 (.294) but bounced back in 1892 to .305. In each of his first four seasons with the Phillies, Thompson finished among the league leaders in total bases and RBIs. He ranked third in total bases in 1889 (262), 1890 (243), and 1893 (263), second in RBIs in 1892 (104), and third in RBIs in 1890 (102). He also tallied a career-high 32 outfield assists to lead the National League in 1891. (It has been suggested that Thompson's assist and home run totals in Philadelphia were aided by the short 300-foot right field fence at the Huntingdon Street Grounds.) The Phillies were a good, but not great team, during Thompson's first four years in Philadelphia, finishing in fourth place in 1889, 1891 and 1892, and in third place in 1890. From 1893 to 1895, Thompson hit his stride with the Phillies. During those three years, he hit .390 and averaged 207 hits, 125 runs, 146 RBIs, 21 triples, and 24 stolen bases. And he compiled those numbers while striking out an average of only 14 times per season. Despite Thompson's contributions, the Phillies were unable to compete for the National League pennant, finishing in fourth place in 1893 and 1894 and in third place in 1895. 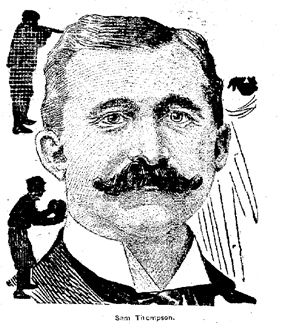 Thompson's 1893 totals included a league-leading 222 hits and 37 doubles. After the 1893 season, Thompson vowed not to return to Philadelphia in protest over the owners' penny-pinching ways and the team's inability to compete for a pennant. In October 1893, Thompson announced: "I shall not play again in Philadelphia, and I told Harry Wright it would be a waste of time for him to write to me about signing. The cheese-paring methods of the management ... have been the causes leading to my resolution. ... The management [has] made a barrel of money, but they grind the players into the dirt." Thompson finally agreed in March 1894 to return to the Phillies, but only after management agreed to improve travel accommodations. In 1894, Thompson was part of the only all-.400-hitting outfield of all-time. All four Philadelphia outfielders ended the season with a batting average better than .400 (Tuck Turner at .416, Thompson and Ed Delahanty at .407, and Billy Hamilton at .404). Thompson missed a month from the 1894 season with an injury to the little finger on his left hand. Doctors determined that the smaller bones in the finger were dead, and portions of the finger were surgically removed in mid-May 1894. Despite the injury and partial amputation, and being limited to only 102 games, Thompson compiled a .407 batting average with a career-high 28 triples and a league-leading 147 RBIs. His 1894 ratio of 1.44 RBIs per game remains the all-time major league record. Also, his 28 triples was the second highest total in major league history up to that time and remains the fifth highest of all time. Thompson also led the National League with a career-high .696 slugging percentage, and he hit for the cycle on August 17, 1894. In 1895, Thompson compiled a .392 batting average with 211 hits in 119 games and led the National League in slugging percentage (.654), total bases (352), extra base hits (84), home runs (18), and RBIs (165). His average of 1.39 RBIs per game in 1895 remains second in major league history—trailing Thompson's 1.44 ratio in 1894. Thompson also continued to perform well defensively with 31 outfield assists, second most in the league. At age 36, Thompson played his last full season of professional baseball in 1896. His average dipped to .298, but he still managed to collect 100 RBIs. Thompson's throwing remained strong as he turned in one of the finest defensive performances of his career. Despite appearing in only 119 games in the outfield, he led the league in outfield fielding percentage (.974), outfield assists (28), and double plays from the outfield (11). One sports writer noted that, even at age 38, Thompson "possessed an arm that the fastest sprinters in the big league had a lot of respect for." As a team, however, the Phillies fell to eighth place in the National League with a 62-68 record. In 1897, at age 37, Thompson was sidelined by pain and appeared in only three games. Some accounts suggest that Thompson's absence from the lineup may have also been the result of his not getting along with Philadelphia's new manager  Without Thompson, the 1897 Phillies dropped to 10th place with a 55-77 record. Before the 1898 season began, Thompson gave an interview in which he questioned the Phillies chances to compete in 1898: "What are the Phillies' chances this season? Six clubs, Cincinnati Baltimore, Boston, New York, Cleveland and Brooklyn are bound to beat them, and they will have to fight hard to lead the second division, and I very much doubt if they can do that." Though his loyalty to the Phillies was questioned, Thompson did return in 1898 and was batting .349 with 15 RBIs, five doubles, three triples, a home run after 14 games. However, Thompson opted to leave the team in May 1898 and return to his home in Detroit. His sudden retirement has been attributed to a "combination of homesickness and chronic back pain." Other accounts indicate that continued tension with manager Stallings contributed to Thompson's decision to retire. Late in the 1906 baseball season, Thompson briefly returned to the major leagues as a player for the Detroit Tigers. With starting outfielders Ty Cobb and Davy Jones out of the Tigers lineup with injuries, Thompson volunteered to fill in. At age 46, Thompson had remained active, playing baseball for the Detroit Athletic Club and other local teams. Accordingly, in late August and early September 1906, he took his old place in right field for Detroit. Thompson's return to baseball led to an increase in attendance, as "the stands and bleachers were full of special Thompson delegations." After getting a hit and two RBIs in his first game, he totaled seven hits, four runs, three RBIs and a triple in eight games with the Tigers. At age 46, he became, and remains, the oldest player to hit a triple in the major leagues. Detroit sports writer Paul H. Bruske noted that Thompson was still able to throw the ball from deep right field to the plate "on a line" and that he still had "a lot of speed on the bases." In 15 major league seasons, Thompson compiled a .331 batting average with 1,988 hits, 343 doubles, 161 triples, 126 home runs, 1,305 RBIs, and 232 stolen bases. He was inducted into the Baseball Hall of Fame in 1974. Thompson was one of the most prolific run producers in baseball history. His career RBI to games played ratio of .923 (1,305 RBIs in 1,410 games) remains the highest in major league history, higher even than Lou Gehrig (.921), Hank Greenberg (.915), Joe DiMaggio (.885), and Babe Ruth (.884). In 1895, Thompson averaged 1.44 RBIs per game (147 RBIs in 102 games), still a major league record. His 166 RBIs in 1887 (in only 127 games) was 62 more than anyone else in the league that year, and it stood as the major league record until 1921 when Babe Ruth collected 168 (albeit in 152 games). Thompson still holds the major league record for most RBIs in a single month with 61 in August 1894 while playing for the Phillies. Thompson was also one of the best power hitters of the era before Babe Ruth. At the end of the 19th century, Thompson's 126 career home runs ranked second only to Roger Connor. Defensively, Thompson still ranks among the all-time major league leaders with 61 double plays from the outfield (16th all time) and 283 outfield assists (12th all time). Thompson has also been credited by baseball historians with perfecting "the art of throwing the ball to the plate on one bounce, which catchers found easier to handle than the usual throw on the fly." Bill Watkins, who managed Thompson in Detroit, recalled: "He was a fine fielder and had a cannon arm and will live in my memory as the greatest natural hitter of all time." In a 1913 story on Thompson, Detroit sports writer Maclean Kennedy noted that Thompson's drives "were the direct cause of more hats being smashed, more backs that were thumped til they were black and blue by some wild-eyed fan sitting in the seat behind, more outbursts of frenzied shrieks and howls of glee, than those of any other player who ever wore a Detroit uniform," barring only the two great stars of the day, Ty Cobb and Sam Crawford. Thompson was married in 1888 to Ida Morasha of Detroit. They had no children and made their home in Detroit until Thompson's death. After retiring from baseball, Thompson invested in real estate and was financially comfortable in his later years. He was appointed a U.S. Deputy Marshall during World War I and also worked as the crier in the courtroom of U.S. District Court Judge Arthur J. Tuttle. He was "well known" and a "well liked" figure at the federal building in Detroit. Thompson died in 1922 at age 62. He had a heart attack while serving as an election inspector on November 7 and was stricken again later in the morning after being taken to his home located at 6468 Trumbull Avenue in Detroit. 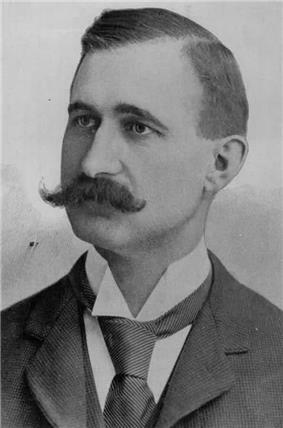 Upon learning of Thompson's death, his former Detroit manager Bill Watkins recalled Thompson as "not only a great baseball player, but as one of the finest gentlemen I ever knew." At Thompson's funeral, "Michigan's foremost citizens -- state and city officials, judges, bankers, doctors, millionaires, laborers -- paid homage ... to their beloved friend," and the neighborhood in which Thompson lived "was packed with expensive automobiles and their liveried chauffeurs" as workmen and wealthy men "discussed their favorite player with an unusual spirit of camaraderie." Thompson was interred at the historic Elmwood Cemetery in Detroit. He was posthumously inducted into the Baseball Hall of Fame in 1974. ^ a b c d Don Thompson. "Sam Thompson". Society for American Baseball Research (SABR). ^ a b "Illinois State Historical Marker for Samuel Luther Thompson". State of Indiana. Retrieved May 13, 2014. ^ David L. Fleitz (2007). More Ghosts in the Gallery: Another Sixteen Little-Known Greats at Cooperstown. McFarland. p. 154. ^ a b "Sam Thompson Minor League Statistics". baseball-reference.com. Sports Reference, LLC. ^ a b c d e f g h i j Maclean Kennedy (February 16, 1913). "Sam Thompson Ranks as one of the Great Sluggers of Baseball History". Detroit Free Press. p. 22. ^ a b c d e f g h i j k l m n o p q r s t u "Sam Thompson Statistics". baseball-reference.com. Sports Reference, LLC. ^ Fleitz, More Ghosts, p. 155. ^ Fleitz, More Ghosts, p. 156. ^ At the end of the 1887 season, Thompson's batting average was recorded as .407, trailing Cap Anson's .421 average. These figures were computed under 1887 rules, which counted bases on balls as hits. In order to normalize 1887 records, researchers later adjusted the records to remove bases on balls from players' batting averages. When the 1887 statistics were adjusted in this manner, Thompson became the batting average leader at .372, topping Anson's average of .347. ^ The "run batted in" was not an official statistic in 1887. 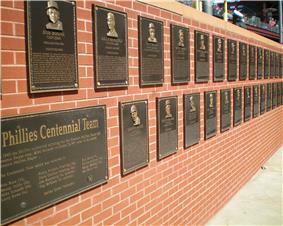 However, researchers subsequently analyzed game-by-game accounts to determine RBI statistics which are now included in baseball's official records. ^ a b c d e f Bill Jenkinson (2010). Baseball's Ultimate Power: Ranking the All-Time Greatest Distance Home Run Hitters. Globe Pequot. pp. 54–55. ^ a b Fleitz, More Ghosts, p. 159. ^ a b Fleitz, More Ghosts, p. 160. ^ "1889 Philadelphia Phillies". baseball-reference.com. Sports Reference LLC. Retrieved May 13, 2014. ^ "1890 Philadelphia Phillies". baseball-reference.com. Sports Reference LLC. Retrieved May 13, 2014. ^ "1891 Philadelphia Phillies". baseball-reference.com. Sports Reference LLC. Retrieved May 13, 2014. ^ "1892 Philadelphia Phillies". baseball-reference.com. Sports Reference LLC. Retrieved May 13, 2014. ^ "1893 Philadelphia Phillies". baseball-reference.com. Sports Reference LLC. Retrieved May 13, 2014. ^ "1894 Philadelphia Phillies". baseball-reference.com. Sports Reference LLC. Retrieved May 13, 2014. ^ "1895 Philadelphia Phillies". baseball-reference.com. Sports Reference LLC. Retrieved May 13, 2014. ^ a b c Fleitz, More Ghosts, p. 162. ^ "Single-Season Leaders & Records for Triples". baseball-reference.com. Sports Reference LLC. Retrieved May 13, 2014. ^ "1896 Philadelphia Phillies". baseball-reference.com. Sports Reference LLC. Retrieved May 13, 2014. ^ Fleitz, More Ghosts, p. 163. ^ "1897 Philadelphia Phillies". baseball-reference.com. Sports Reference LLC. Retrieved May 13, 2014. ^ a b "Philadelphia News - Thompson's Unwise Criticism of the Phillies". Sporting Life. February 12, 1898. p. 9. ^ Fleitz, More Ghosts, p. 164. ^ a b Paul H. Bruske (September 9, 1906). "The Temporary Return to Duty of Sam Thompson a Noteworthy Event". Sporting Life. p. 6. ^ Paul H. Bruske (September 22, 1906). "Jennings for Detroit". Sporting Life. p. 19. ^ "RBI Records / Runs Batted in Records". Baseball Almanac. Retrieved May 13, 2014. ^ "Career Leaders & Records for Double Plays Turned as OF". baseball-reference.com. Sports Reference LLC. ^ "Career Leaders & Records for Assists as OF". baseball-reference.com. Sports Reference LLC. ^ a b c "Sam Thompson, Diamond Star of Early Days, Passes Beyond: Famous Hitter of 1887 World's Series Champion Detroit Team Succumbs to Heart Disease - Stricken in His Sixty Second Year". Detroit Free Press. November 8, 1922. p. 16. ^ "Thompson Great Slugger In His Day". The Sporting News, date=November 16, 1922. p. 2. ^ "Sam Thompson Dies: Former Big Leaguer Stricken with Heart Attack". The New York Times. November 7, 1922. ^ "Sam Thompson Is Paid Homage: Citizens of All Walks Join In Tribute at Old-Time Ball Players Funeral". Detroit Free Press. November 12, 1922. p. 15. ^ "Sam Thompson". Find A Grave. Retrieved September 25, 2012.